Manufactured baby carrots that we see at the store are a result of taking all the broken and “ugly” big carrots they can’t put in the package, grinding them all up, processing them into the “baby” carrots and giving them a bath in chlorine to give them a bright orange color. The package doesn’t say “Chlorine” because it was added as part of manufacturing and not added as an ingredient. Packaged foods contain lots of chemicals both in the ingredients and in the manufacturing process. Chemicals added as part of the manufacturing process are not considered to be an ingredient therefore does not have to be listed on the food label. So there is no way to tell what else is hiding in that box or package. Chlorine is a pesticide. Its purpose is to kill living organisms. This is the same chlorine that is added to swimming pools, but now you are ingesting it when you eat packaged baby carrots. When you ingest chlorine, it kills some parts of our body like the healthy bacteria in your gut and intestinal flora. Chlorine is a highly toxic, yellow-green gas most heavily used in chemical agents like household cleaners and can be found in the air near industrial areas especially around paper processing plants. Chlorine has been linked to many health problems, including lung diseases and cancer. 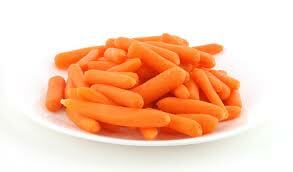 It is best to buy organic whole carrots, peel, and cut them yourself. They taste better and is much healthier.